This is the seventeenth post of our series of projects to make us thankful for DIY. Be sure to check back everyday during the month of November for new simple and easy DIY projects. In tight spots where space is at a premium, sliding doors called pocket doors get installed by builders. They run on a track and often slide inside a wall, disappearing out of sight. They allow access into tight spots where traditional swing out doors would have taken up too much room. A sliding barn door is another modern update in the pocket door family. In this case, the track is often exposed and the hardware is made to look aged. The hardware being exposed is part of the charm. The door itself is made of pine (or other available wood) and has cross beams which are modeled to look like a door on a barn or stall. 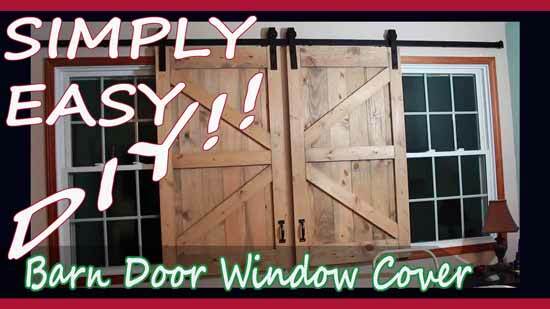 I hope you enjoyed today's featured project and don't forget to stop by "I'd Rather Make It Myself" YouTube channel to check out even more great DIY and woodworking videos from them. Don't forget to subscribe.